Not all things are cheap, though this pretty rare boxed Sega Mark III console bundle does deserve its eBay Buy Now price of 249$. Besides, it does come with 5 games (Hang On, Afterburner, Kenseiden, Phantasy Star, Doki Doki Penguin Land), a boxed FM unit, all necessary cables and two controllers. Seller ships worldwide. 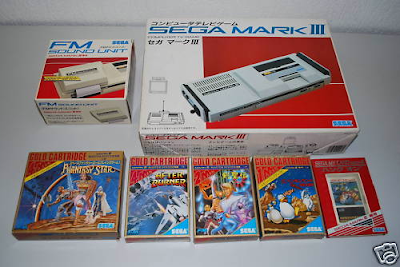 Oh, and in case anyone was wondering, the Sega Mark III is the original Japanese version of the Sega Master System. Ha ha, what a coincidence! I was searching randomly for Sega peripherals and I find a blog post on the Very package I bought! I have to tell you all that it is a dream, and an excellent package. I have since found cheaper Mark III's and FM Units on Yahoo Japan, but still, with the games and everything really in almost new condition, I have no regrets buying this. now I'm looking for other items like the one button paddle controller. Why, glad to know it's as good as I thought (wished) it would be. Congrats on your lovely new retro purchase and thanks for the mini review. Cheers!